The very mention of Nepal invokes visions of high snow capped mountains and diverse cultures. Long before westerners were able to scale the sacred peaks, the Nepalis had established temples, monasteries, palaces and complex townships to rival the technologies of the world. Within a short radius of Kathmandu, UNESCO has designated 7 World Heritage Sites. This is a country of intriguing mixtures of ethnic diversity, nature, architecture, arts and cultures. If you have limited time and you wish to familiarize yourself with Kathmandu and its offerings, a sight seeing tour would be the answer. 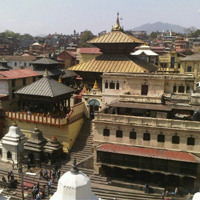 The Kathmandu valley has a traditional as well as a modern setting. Surrounded by mountains on all sides, the valley consists of three cities of historic, cultural and political importance - Kathmandu, Patan and Bhaktapur. The valley is at 1136 m. above sea level. Kathmandu valley is situated at an elevation of 1336 meters / 4400 feet above sea level and is proud of its magnificent location. 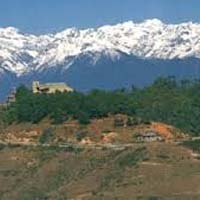 It is surrounded all around by lush green rolling hills with beautiful sights of the Himalayan panorama on the north.The city contains more architectural marvels in a square mile than any other city in the world endowed with very ancient, unique, unrivalled art and culture. The Kathmandu city and twin medieval cities Bhaktapur and Lalitpur make up the Kathmandu Valley. 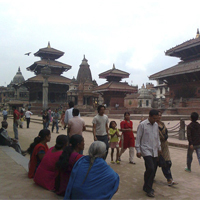 Kathmandu Durbar Square is one of the most important sights in the valley. It is full of Ancient historic palaces, courtyards, carvings, colourful life and many others. The nine-storied Basantapur Durbar (palace) built by the head artists of the then three separate kingdoms (Kantipur, Lalitpur, Bhaktapur and Kirtipur), Kumari Ghar - a 17th century artistic building dedicated to Kumari -the Living Goddess, Nasal Chowk - The ceremonial courtyard of the monarchs are just a few highlights here. Just about 2 kilometers to the west of the Kathmandu Durbar Square perched on top of a hill is the majestic stupa of Swayambhunath. 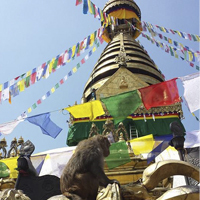 The route meanders through the alleys of old Kathmandu to Swayambhunath - The stupa was built between 460 and 1200 AD. 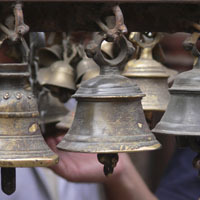 Its establishment is linked to the creation of the Kathmandu Valley and it is one of the holiest Buddhist sites in Nepal. The views of the valley from the hilltop are great. 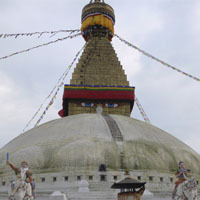 Bouddhanath stupa is one of the largest and oldest stupas in the world. It lies about 6 kilometers to the east of downtown and is very close to the temple of Pashupatinath - the most revered Hindu pilgrimage site in Nepal. One of the holiest Hindu shrines in the world, the temple of Pashupatinath is 5km to the east of the city center. The fabulous pagoda houses the lingam (phallic symbol) of Lord Shiva. The complex contains many other temples as well as the holy Bagmati River, which flows through this complex and is the place where many cremations take place every day. 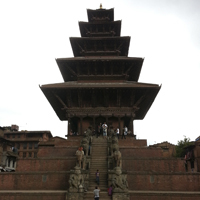 Bhaktapur, literally meaning "city of devotees" is about 14 kilometers east of kathmandu. 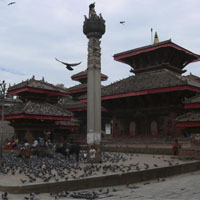 The Durbar Square is a living museum of ancient art and architecture. The elegant 15th century Palace of 55 windows, artistic courtyards, the Golden Gate, the five-roofed Nyatapol temple soaring gracefully into the sky from atop a five-storied base and many others fascinate the travelers. Thimi - a typical Newar village famous for pottery is another highlight and a perfect combination. Patan is one of the ancient cities about five kilometers southeast of kathmandu. Also known as "the city of artists" and "the city of beauty", it is full of Buddhist monuments and Hindu temples with fine gateways, guardian deities and beautiful carvings. The Krishna Temple (an octagonal granite edifice dedicated to lord Krishna), Kumbheswar Temple (one of the premier places that celebrates Janai Poornima - the Sacred Thread Festival), the Golden Temple / Hiranya Varna Mahabihar - "Eternity Itself", the Patan Museum, Patan Industrial Estate (specializing in cottage industry hand loom and handicrafts), the Tibetan Refugee Centre and the Central Zoo (the only zoo in Nepal) allure all the travelers to Patan. Sightseeing in Kathmandu- You will be picked up by a car at 7:00am. Then, drive to Boudhanath, Pashupatinath, Bhaktapur, Patan, Kathandu Durbar Square and Swayambunath simultaneously. There will be a lot of restaurant near by sites so, you can have your lunch at favourable place and time accordingly. We will be visiting six of the World heritage sites in Kathmandu. 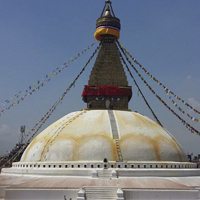 Boudhanath Stupa: Boudhanath Stupa is another important Buddhist pilgrims site. This ancient Stupa is considered one of the biggest in the World. Every morning and evening, many Buddhist devotees come here to pray and circumambulate enabling the visitors to observe local religious practices. Pashupatinath Temple: The sacred Hindu temple Pashupatinath is considered the holiest cremation ground, and people bath in the Bagmati River with a faith of cleansing themselves spiritually. Many Sadhus or Hindu Ascetics live here. During religious festivals, Hindus come to make offerings, and it is sometimes very crowded. Bhaktapur Durbar Square: Bhaktapur, which literally means "city of devotees" is about 14 kilometers east of Kathmandu. The Durbar Square is a living museum of ancient art and architecture. The elegant 15th century Palace of 55 windows, artistic courtyards, the Golden Gate, the five-roofed Nyatapol temple soaring gracefully into the sky from atop a five-storied base and many others fascinate the travelers. Thimi - a typical Newar village famous for pottery is another highlight and a perfect combination. Patan Durbar Square: Patan is one of the ancient cities about five kilometers southeast of Kathmandu. Also known as "the city of artists" and "the city of beauty", it is full of Buddhist monuments and Hindu temples with fine gateways, guardian deities and beautiful carvings. The Krishna Temple (an octagonal granite edifice dedicated to lord Krishna), Kumbheswar Temple (one of the premier places that celebrates Janai Poornima - the Sacred Thread Festival), the Golden Temple / Hiranya Varna Mahabihar - "Eternity Itself", the Patan Museum, Patan Industrial Estate (specializing in cottage industry hand loom and handicrafts), the Tibetan Refugee Centre and the Central Zoo (the only zoo in Nepal) allure all the travelers to Patan. Kathmandu Durbar Square: Kathmandu Durbar Square is one of the most important sights in the valley. It is full of Ancient historic palaces, courtyards, carvings, colourful life and many others. The nine-storied Basantapur Durbar (palace) built by the head artists of the then three separate kingdoms (Kantipur, Lalitpur, Bhaktapur and Kirtipur), Kumari Ghar - a 17th century artistic building dedicated to Kumari -the Living Goddess, Nasal Chowk - The ceremonial courtyard of the monarchs are just a few highlights here. Swayambunath Stupa: Swayambunath Stupa (Monkey Temple). It is said that Swayambunath Stupa is more than 2,000 years old, and it symbolizes knowledge. The painted eyes on all four sides symbolize the all-seeing power of Buddha.It is situated to the west of the city on a hill some 77 meters above the valley. Drive back to your hotel. Enjoy the evening at your own. • Tips for Driver and guides. It would be easy for you if you have your own group if not also we can arrange a group trek according to your request. You would be joining the group in Kathmandu. If you want to have a solo trip then we are always ready to help you again with single supplement charge. We try our best to make your comfortable holiday in the beauty of Nepal. 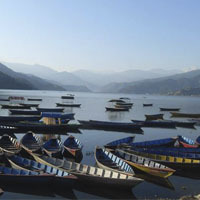 Climate in Nepal is diversified depends on season. From the low level to highest point of the World, it starts from hot to cold region from South to North. You can travel Nepal in any season but the best time to visit in Nepal is autumn & spring. If you are in autumn the weather is perfect and sky is crystal clear but in spring the weather seem little cloudy but the full blossoming Rhododendrons are awesome. In Summer visibility is poor and there is less chances to see the himalayas and in winter it is very cold in mountain but still possible to do this trip. While you travel Nepal, you need to obtain the entry permits and TIMS permit. All the applicable permits and entry fees are including on the given cost except personal contribution and donations. In case of extra charge and payment, the agency will inform you. NEAT is highly aware with Environmental concern and keep right ecological system. There shouldn’t be awful impact while you travel around the Nepal. So, we involve some campaign of cleaning trekking trails, works with KEEP project etc.